Fréjus is not the oldest garrison of colonial troops in Metropolitan France but it is certainly the one that is best known to all colonial soldiers. Its closeness to the sea, the immense frontier across which lies the overseas domain, the past History of this town which a very great colonialist, Galliéni, had chosen as a wintering resort for troops from all over the empire, determined its choice for the museum where it could be shown that the warlike activities of this army were but an aspect of its History. 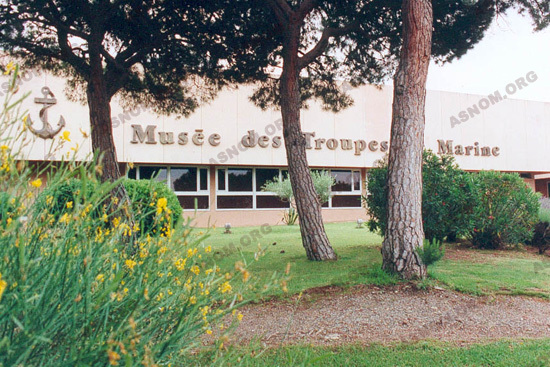 Moreover, there are close links between Fréjus and the Colonial Health Service because four colonial military hospitals have been established there from 1914 to 1918 : Hospital N° 55 (Fréjus centre), Hospital N° 88 (on the site of the future Hospital Jean-Louis), the Senegalese Hospital (N° 66) and the Annamese Hospital (N° 67) near the Galliéni camp. One of the tasks of this museum is to preserve the traces and proofs of the pacifying and civilizing role played by France in its colonial Empire. For years these regions had been traversed by gangs who made their fortunes with banditry, pirating and trafficking, beginning with the slave trade. Insecurity was a permanent feature. ). In fact, we should be aware that all the people on earth have practised slavery in the course of History - even Europeans in the Early Middle Ages, when Christians sold their fellow Europeans - Saxons, Circassians, Magyars and other Slavonic people - to the Muslims. So it is as liberators that our first colonists, who penetrated into remote African regions, introduced themselves in the course of the second half of the 19th Century. It is to the merit of the naval troops that they put an end to the odious trafficking that was a disgrace to mankind". 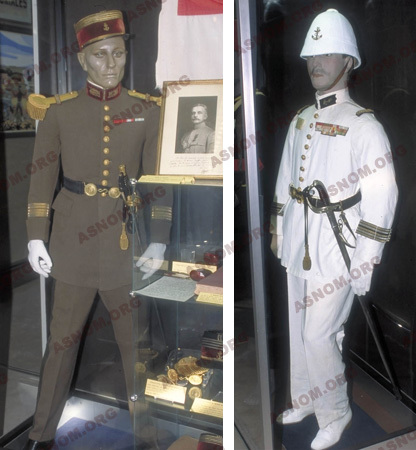 If colonisation brought welcome peace to the overseas civil populations, it also improved their life expectancy and the collections in the museum illustrate this theme. The Colonial Health Service is presented in many display cabinets and also in a memoir. The multiple aspects of an unequalled achievement for the benefit of civil populations is therein described. Often ignored by the general public, the work accomplished deserves to be explained and illustrated. It is provided with appropriate premises and equipment and offers researchers, students and teachers a large field of investigation. The face of light and liberty".